The BreedingGuaiabero Parrot Bolbopsittacus lunulatus, is a little known species which has only been maintained within aviculture on a few occasions outside its endemic range of the Philippine islands. Those few birds that have been seen in aviculture did not adjust well to captivity and no breeding of this species has previously been recorded. The Research and Breeding Centre operated by Birds International in the Philippines has maintained a number of Guaiabero in captivity for an extended period of time and managed to achieve the first world breeding of the species in 1993. A complete husbandry report is currently in preparation from several joint authors, but given here are my preliminary notes from working with, and breeding, the species. The Guaiabero measures around 15 cm in length. In appearance it is a short stocky bird with a broad head, a short broad bill, and with short rounded wings and tail. In adult birds sexual dimorphism is clearly apparent. The male has mainly green plumage, which becomes more yellowish on the underparts of the body. The forehead, lores, periopthalmic region, throat and lower cheeks are blue; a blue collar encircles the neck and meets the blue cheeks. Blue is also present upon the bends of the wings. The rump area and upper tail coverts have a yellowish tinge to their green colouration. The upper wing coverts are also of a yellowish green shade. Pale yellow runs across the underside of the secondaries. The bill is grey, becoming black towards the tip; the legs are grey. The female differs from the male by having blue only upon the throat and lower cheeks, by having a yellow collar on the hindneck (with some fine black markings) and by having similar markings on the yellowish green rump feathers. Notes on the appearance of development of the Guaiabero chick follow later in this article. Fledged immature birds resemble the hen except for the lighter colouration of the bill. In the description given by Joseph M. Forshaw (1989, Parrots of the World, Cassell P.L.C. ), four subspecies are described. The nominate is listed as occurring from Luzon and has already been described. Bolbopsittacus lunulatus intermediusB. l. intermedius is listed as occurring from the island of Leyte. The male is described as differing from the nominate by his underparts being a darker green; the blue on the face being darker with a purple tinge; and by having a brighter blue collar. The female is described as differing from the nominate by the blue colouration restricted to the throat; by having pale green cheeks; having a paler shade of green around the eye; having a more orange collar and by lacking the yellowish tinge to the green rump and thigh colouration. Bolbopsittacus lunulatus callainipictusB. l. callainipictus is listed as occurring from the island of Samar. The male is described as being similar to B. l. intermedius, but with the general plumage being more yellowish, particularly on the underparts; the blue on the face being darker and more greenish and having less blue on the cheeks. The female is described as again being similar to B. l. intermedius, but having a brighter yellow nuchal collar and rump. Bolbopsittacus lunulatus mindanensisB. l. mindanensis is listed as occurring from Mindanao and Panaon. The male is described as differing from the nominate description by having green cheeks separating the blue periopthalmic region from the blue throat; the blue hindneck collar being a brighter and darker blue; the head has a yellowish tinge contrasting with the purer green of the back. The female is not noted as differing from the nominate description. To date, the Guaiabero that I have worked with in captivity have all been of the nominate subspecies which occurs from Luzon, except for a single female specimen of B. l. callainipictus which came from the island of Samar. In the case of this single female bird, the plumage colouration did not appear to differ significantly from female birds of the nominate subspecies. A brief examination of available skins of the different subspecies in the collection of the Philippine National Museum proved inconclusive as in many specimens the plumage colouration was to some degree faded and the subtle differences in colouration will have to be accurately assessed by comparison with live specimens rather than preserved skins. In behaviour the Guaiabero is a shy, quiet bird which, when compared with other Psittacines, is to me most reminiscent of the Blue-rumped Parrot Psittinus cyanurus. Guaiabero generally move slowly and carefully. As they move around by climbing along the perching, they rarely seem to fly within their cage unless something startles them. For much of the time they seem to take little notice of their respective mates and do not seem to exhibit close pair-bonding, even in the case of the pair which has now successfully bred. The husbandry of the Guaiabero is very similar to that I use for Opopsitta species, although the Guaiabero requires even more seclusion and privacy in the accommodation provided. While the accommodation for this species needs to be secluded, it is also essential that discreet regular observation can be carried out by the keeper. This is also a bird that does not like to descend from the level of the aviary perching and is rarely, if ever, seen voluntarily at ground level. Because of this a new design was used in 1993 which allowed for food, water, perching and the nest site to be located all at the same high level within the cage. This is thought to be one of the main reasons why breeding success was achieved for the first time in 1993. The diet of the Guaiabero at the Research and Breeding Centre consists of four small feeds given each day. The first and third feeds consist of various chopped fruits and vegetables including papaya, plantain banana, steamed sweet potato, steamed carrots and chico. The second and fourth feed each day consist of millet seeds, a dry powdered food made from various baby cereal foods, rice cereals, banana and either guava or chico. A commercial brand of multi-vitamins and mineral powder is sprinkled over the food at each feeding period. From the notes I made of several parent-incubated eggs monitored during the 1993 breeding season, it appears that the incubation period for this species is 22 days. Artificial incubation has not so far been attempted. The eggs are white in colouration and can be considered as of normal appearance and shape for Psittacines. Clutches I have observed so far have consisted of either three or four eggs. 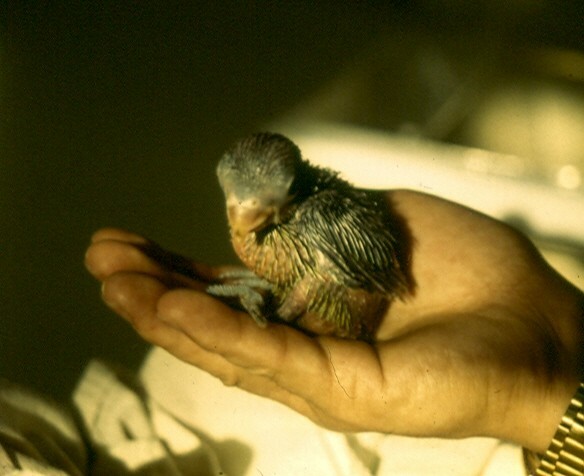 In the case of the chicks hatched during 1993, in all cases they were incubated and hatched by their parents before being removed and taken to the nursery department for hand-rearing soon afterwards. I made the following notes on one of the chicks reared from the first clutch of eggs. On being removed from the nest box it was estimated that he chick had hatched around 12 to 15 hours earlier; its weight upon arrival at the nursery was recorded as 8 grams. When newly hatched the skin coloration is light pink, the chick does not have any natal down covering the skin. At this early age the chick is very unstable in its body stance, although it did seem to be quite active. Day 5 - The chick is now much stronger and can easily maintain an upright body stance. The eyes are just beginning to slit. The toe nails are turning light grey and the bill is white. The upper mandible has a noticeably slender shape. Day 13 - Both eyes are fully open. The toe nails are now black and the feet are grey in colour. The first signs of developing pin feathers can be seen forming underneath the skin. Day 18 - The first pin feathers are just starling to emerge through the skin, those of the flight feathers. Day 20 - Tail pin feathers are just starting to emerge through the skin, pin feathers are nearly ready to appear over the head. Day 23 - Flight pinfeathers now measure more than 1 cm. Pin feathers are now also emerging through the skin on the thighs, breast and mantle. The tail pin feathers are now well developed. Day 27 - Much of the head and tower body is now covered by short pin feathers, with the flight pin feathers measuring more than 2 cm. The bill is becoming darker in colour. Day 32 - Pin feathers are now covering most of the body, except the flank regions. Some flight pins are now just starting to split through their quilting. Day 35 - The bill is now greyish-brown in colour. The pins covering the head and body are becoming larger and showing more of the feathers colouration through the quilting. Day 39 - The feathers of the upper wing coverts have broken through their quilling and the flight pins are continuing to split through their quilling at the tips of each feather. Day 41 - Most of the upper wings are now feathered, there is still some quilting covering the base of the flight feathers. The breast is also feathering with most feathers having broken through their quilting. Day 44 - The breast, abdomen and sides of the head are now well feathered. Tail feathers are starting to split through the quilling to appear. Day 48 - The wings, upper back, breast and abdomen are all now feathered, the head is continuing to become more extensively feathered. The feet are grey with black toe nails, the bill is light grey in colouration. Day 51 - The only areas which are not yet fully feathered are the crown, forehead, ear coverts and the flank regions. Day 65 - The chick is now fully feathered. Weaning began around day 70 and was completed by day 87. After weaning the weight of the chick stabilised at between 65 - 70 grams. The Guaiabero remains one of the most difficult members of the Psittidae family to maintain and breed in captivity, but having now achieved successful reproduction for the first time during 1993 it is hoped that more consistent success will follow. A more detailed description into the captive husbandry and breeding of the Guaiabero at the Research and Breeding Centre is scheduled for preparation towards the end of 1994. (Note - The author has since left the Birds International collection is now working as an Avian consultant to Loro Parque in Tenerife).